The mystery of where Leonardo da Vinci is buried could be laid to rest after scientists began a painstaking hunt for his DNA. 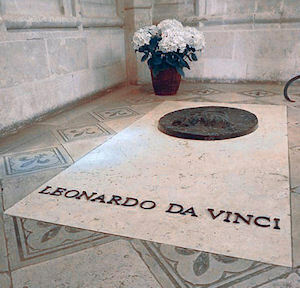 Leonardo was originally interred in the chapel of Saint-Florentin at the Chateau d'Amboise in the Loire Valley, but the building was destroyed in the French revolution and it is believed his remains were reburied in the castle's smaller chapel of Saint-Hubert in the 19th century. Now scientists are hoping that advances in genetic testing could, finally, give an answer. They believe that Leonardo may have left traces of his DNA in paintings, notebooks and drawings, and are planning to study works for fingerprints, flakes of skin and even hair.